One of Jeep’s latest concept vehicles is the Shortcut. While it looks like a trimmed down version of the Wrangler, the Shortcut actually pays tribute to the CJ-5, a World War II vehicle that was in production between 1954 and 1983. To learn more about this interesting concept car, keep reading for more details. When building the Jeep Shortcut, engineers started with the body of the Jeep Wrangler and then cut 14 inches from it. Then they removed the rear-mounted spare tire and pulled the bumpers close into the body of the vehicle. These modifications took off another foot in length. This brings the Shortcut in at a good two feet shorter than the Wrangler. The exterior of the Shortcut is where you really start to notice some of the vintage style of the CJ-5. The plastic bumpers are gone, and in their place are modern and minimalistic steel bars. There are two slots on the front and rear bumper to hold a license plate, but other than that it’s all sleek and smooth metal. Additionally, the hood has a classic dome in the center just like the CJ-5. The doors have been completely removed, and the holes from the hinges were filled in for a seamless look. Without any doors, the side of the body now holds the round side-view mirrors. The modern roll bar came off, and a traditional support is now in its place. The custom taillights are flush against the tailgate, which now folds down instead of swinging out like many modern tailgates. Finally, all of this sits on top of 17-inch solid steel wheels and heavy-duty mud-terrain tires. Since the traditional supports can’t protect backseat passengers like the modern roll bar, the rear bench was completely removed from inside the Shortcut. The floor got a coat of red truck bed liner to make for easy cleanup, and designers painted the lower half of the dashboard red to blend in with the rest of the interior. The driver and passenger seats come wrapped in alligator-style leather with cloth inserts in a red plaid design. The center console lid keeps the red alligator-style leather going, and even the shifter gets a special pop of color with a red ball knob. 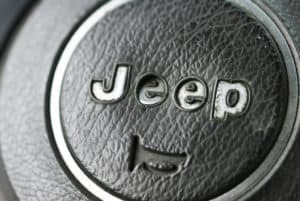 Pop open the hood of the Jeep Shortcut and you’ll find the standard 3.6-liter, V6, Pentastar engine that gets 285 horsepower and 260 lb-ft of torque. You’ll also get a five-speed automatic transmission. However, because the Shortcut is at home on the back roads, the suspension got a nice upgrade. Dana 44s are on the front and rear axles, and the suspension got a two-inch lift with the help of Fox Racing shocks. These improvements help the Shortcut take on nearly any off-road condition you can find. The Jeep Shortcut is a modern take on the combination of a Wrangler and a CJ-5. Even though this concept vehicle has a bright and bold red interior, it’s also not afraid to take on any off-road challenge.